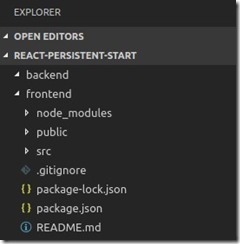 After having recently picked up the React framework, I figured I’d share how I quickly setup my projects to implement persistence. This way you spend minimal time setting up the skeleton of your application, letting you focus on adding functionality. This is done by combining a few tools. Let’s take a closer look. Should you be interested in the code itself, go ahead and get it here. Be sure to install a package manager like npm or Yarn. We will use it to install and run some of the other tools. If you ever worked with React you undoubtedly came across this CLI tool. It is useful for providing the boilerplate code you need for the front-end of your application. Take a look at the documentation to get a sense on how to use it. This is the database we will use – be sure to download, install and start it. It’s a NoSQL database and uses a JSON document structure. Fire up your terminal. Install create-react-app globally. Navigate to your frontend folder. Initialize your first application. The service we created is available on http://localhost:3030/employees. Navigate there. 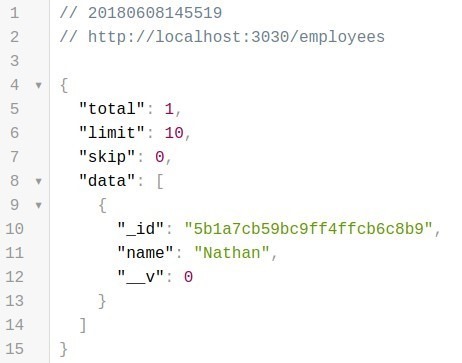 You should see JSON data – though right now all you’ll probably see is metadata. By using this address we can make REST calls to see and manipulate the data. You could use curl commands in the terminal, simply use the browser, or install a tool like Postman. Next up we need a way to access this service in our frontend section of the application. 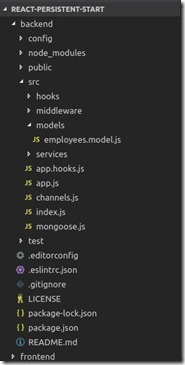 For this purpose, let’s create a folder in the location: frontend/src/api. In here, create the file Client.js. Be sure to run npm install after updating this file. That’s basically all we need to perform CRUD operations from our front-end section of the application. To make the example a little more vivid, let’s implement a button into the App.js page which was automatically generated by the create-react-app CLI. 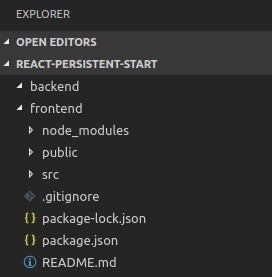 Navigate to the frontend section in the terminal, make sure the node modules are installed correctly by running npm install. Now use command npm start. 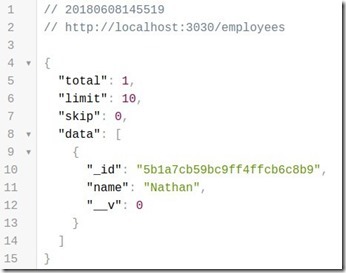 Navigate to http://localhost:3030/employees. Verify there is no employee here. On http://localhost:3000 our page should be available and show a single button. Click the button and refresh the http://localhost:3030/employees page. You can see we have added an employee with the same name as yours truly. Using the code provided in the handleClick() method you can expand upon this. 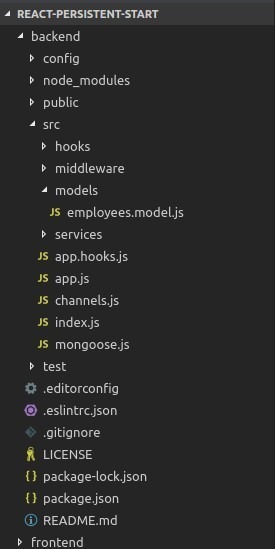 See this link for all the calls you can make in order to provide CRUD functionality using FeathersJS. That’s basically all you need to start adding functionality to your persistent React application. Happy developing! The code is available here.